To dance is to move with awareness, with harmony in relationship to music, with other people’s movements or with emotions. It is moving by embodying and enacting traditions, rituals, and ways of thought, while allowing these traditions to evolve each time the dance is practiced and performed. But dancing is also making statements, sharing memories, challenging one’s own and others’ assumptions. Dancing enhances awareness, perception, and allows entering into contact with forms of movement, rhythms, and ways of thinking with which you are unfamiliar. I love dance and dancing and I practice some contemporary dance myself, so I’d like to share some information about how people dance around the world throughout time. Not being an expert in international forms of traditional and modern dance in spite of my interest in it, let me take a moment to recognize those who helped orient me in my research. Among them were friends, colleagues, and librarians. Our South Asian Studies Librarian, Mara Thacker, who is both a lover and practitioner of dance, was especially helpful. In this post, I will address some dances from some parts of the world that may yet be unknown many people. While not comprehensive, this is an informational glimpse of how dancing happens in different cultures and in different contexts, both historical and situational. Have you heard of the Mexican Son Jarocho? This beautiful dance style originates from the Mexican states of Veracruz, Oaxaca, and Tabasco. As with most traditional Latin American dances, it blends traditions from multiple cultural backgrounds. The particular case of Son Jarocho contains influences from indigenous traditions, Afro-Caribbean influences, and Spanish traditions, mainly from Andalucía. It is danced in couples and one of the main characteristics is the stamping that both male and female dancers perform with special shoes. In fact, this stamping is not only a dance step, but it also becomes a main source of percussion that leads the rest of the instruments. You can find a similar style of stamping in Spanish Fanangos. See the video below for a folkloric, ballet-style performance of Son Jarocho. “Mexican Dance Forms: A Bibliography with Annotations” is a book compiling some major traditional Mexican dances. These are other interesting resources you can find at our library if you want to know a little more about one of the many dance styles in Mexico. But Mexican dancing has much more than folk dances like Son Jarocho and Jarabe Tapatío. Mexico also has one of the strongest traditions of contemporary dance in all of Latin America. Delfos Danza Contemporánea is a renowned dance company that offers education, residencies, and has a large performance background where their local experience dialogues with international tendencies in dance and world-class training. To stay, for a moment, in Latin America, what do you think of when thinking of Latin American dances? Salsa, bachata, merengue. Correct. But what about the southern parts of Latin America? Tango! Correct! Chile, Uruguay and Paraguay also have rich varieties of traditional dances but sadly we will not be able visiting them here. However, in other countries from the South, there is a strongly rooted tradition of gauchos, male “cowboys,” found in contiguous regions of Argentina, Brazil and Uruguay. The dances they perform have slight variations in these three countries, but in general, the gauchos’ practice with moving cattle around by foot or riding horses evolved into a very vibrant dance involving vigorous foot stamping. In Argentina, one of the traditional gaucho dances from the south of the country is called malambo. Some versions feature the skillful handling of boleadoras or bolas, stones tied with robes initially used by indigenous peoples for hunting, and then adapted for cattle as well. More modern and acrobatic versions demonstrate an evolved use of the boleadoras for special spectacles. Argentina is one of the leading countries for contemporary dance in Latin America. According to La danza moderna argentina cuenta su historia : historias de vida (roughly, Modern Argentine Dance Tell Its Story: Stories of Life), its practice in that country started in the early 1940s. Currently Argentina is one of the few countries in Latin America that has a state-funded, national contemporary dance company “Compañía Nacional de Danza Contemporánea” (National Company of Contemporary Dance.) Check out a great piece by the company below. To wrap up with Latin America, here is a list of interesting resources including books, films and audio recordings that are relevant for those interested in how people move across this region. Now let’s travel to East Asia, a region that is entirely new to me in terms of dance. I’ve learned more about its dance traditions though my very dear Korean friends at UIUC and some independent readings. For starters, Korean folk Dance reveals the many, varied influences that come together in Korean traditional dance, including elements from other countries and varied religions. Different moments in Korean history also display an impact on expression, not to mention varied contexts like communal agrarian contexts, religious celebrations and entertainment. This book addresses Korean dances from as early as 200 BC until present day, when folk dance intentionally and actively preserves cultural heritage. In fact, certain dances from the Goryeo Dynasty (918-1392) and Joseon Dynasty (1392-1910) are currently protected by a cultural law issued in 1962. 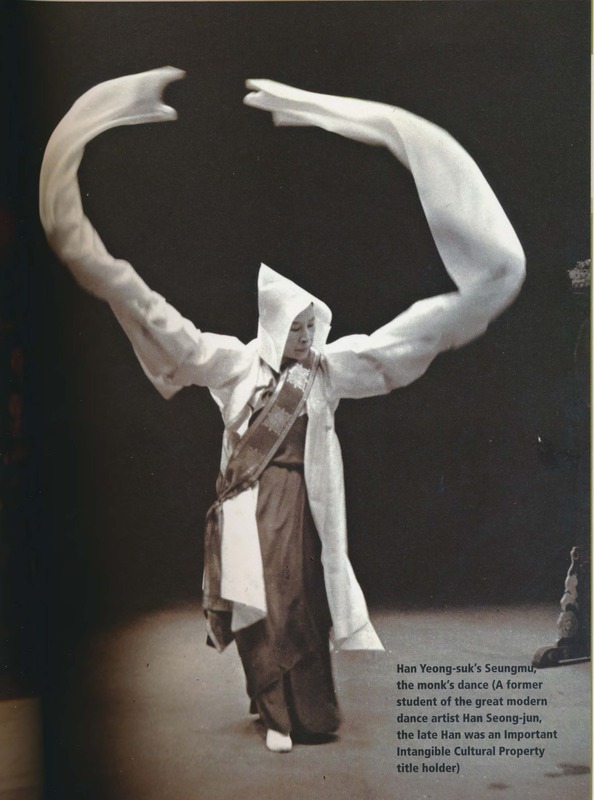 After Japanese colonial rule (1910-1945) and the strong influence of Western civilization after 1945, traditional Korean dance was in danger of disappearing. In this context, these dances officially became known as Important Intangible Cultural Heritage, a category that brought about legislation to preserve and train people in each dance form. This is the case for Seungmu, the monks’ dance, a type of folk dance performed by professional entertainers. Other Korean traditional dances are Bucheachum -or fan dance-, a stunning group dance performed by female dancers wearing bright hanbok dresses and using fans for displaying several figures as butterflies and flowers. This dance’s origins are associated with shaman and it is currently performed in varied celebrations. Also, the Ganggangsullae or harvest dance, practiced as a fertility ritual in the southwestern part of the Republic of Korea, is also performed during the Chuseok holidays across the country. This dance is included in UNESCO’s Representative List of the Intangible Cultural Heritage of Humanity. Check out some others here. Now, going beyond folk dance, Korea currently has a rich development of modern and contemporary styles. Through Contemporary Dance Scenes of Korea, I discovered another angle of movement in that country. 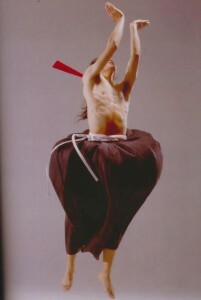 Modern and contemporary dance in Korea have experienced rich growth in recent years, which has included the reflection about a search for Korean identity, dialogues between traditional movements and contemporary experimentation, inner exploration, dialogues between eastern and western aesthetics, and an intense search for Korean symbols of femininity. Modern dance has been particularly important for current artists who faced violence and repression after the Korean War. As recently as 1978, only 22 performances took place in Korea, and from those, only three were contemporary dance and the other three were ballet. Currently, there is a National Contemporary Dance Company, which has an interesting global reach. Dance, therefore, has served for sharing memory, making statements and coming up with creative proposals about contemporary Korean culture, in dialogue with its recent and ancient past. Of course we cannot ignore perhaps the most popular dance form among contemporary Korean youth: K-Pop!! Check out some moves from this dance style. Photo credit: Cho, Tong-hwa, and Kim, Kyŏng-ae, “Contemporary dance scenes of Korea”, Seoul, Korea : Korean Information Service, 2001. Let’s jump to another continent now. Let’s talk about West African dance. 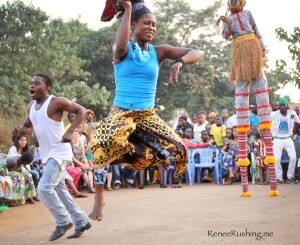 Similar to what occurs with other cultural traditions, dance in West Africa developed and evolved as a very important component of communal life. As a main feature, West African dance is highly energetic, involving vigorous and simultaneous movements of the head, arms, legs and feet. Even with this feature, there is still a great variety in terms of genre including village and ballet. In the case of dance from Guinea, village dancing is practiced in a circle where the community gathers around live drumming as a core component of the dance and community members enter and exit the circle at their will to improvise a dance. Other community members participating in the dance accompany the performance by clapping and cheering. 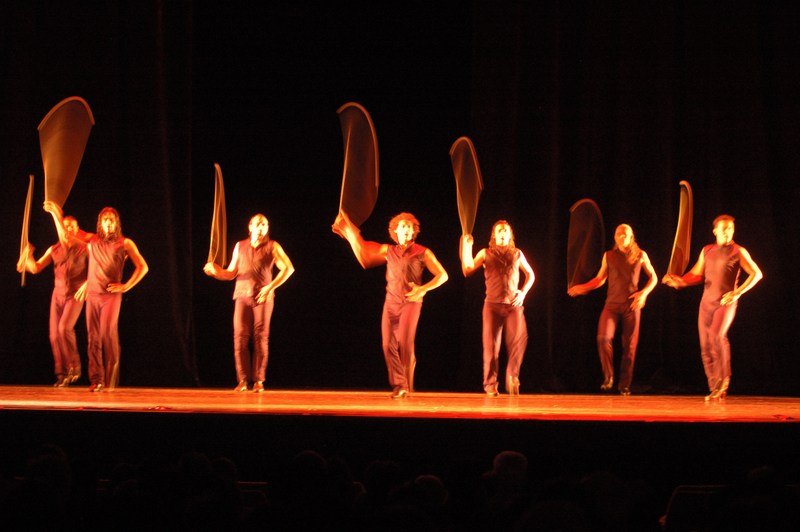 The percussive instruments used for this dance style are the djembe and then a family of drums called the dununs. 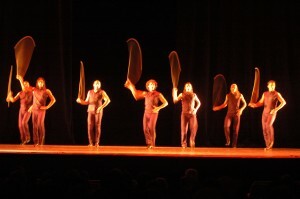 Instead of the dancer responding to the drums, in this dance style, the main drummer or djembe soloist tries to follow the dancers’ feet to accent their movements and simultaneously maintain the tempo. Mara Thacker provided a good deal of information about these styles: “Ballet style is choreographed…(it) has a different set up to the drums and the drummers will give a musical cue called “breaks” to signal to the dancers during a choreography….The dununs have three drums, the largest bass drum is the dundunba, the middle is the sangban, and the smallest is the kenkeni. In ballet style, the three are usually played as a set, which, in village style, each is played alone along with a cowbell that is attached to the top of the drum. There are other types of drums and instruments that are played, including the balafon which is much like a xylophone and the cora which is a stringed instrument.” Mara also highlighted that one of the most commonly taught African styles in the U.S. is “lamban“. Here is another lamban performance you can see. To see more village style dancing, check out this documentary about Chuck Davis’ travels. Davis is a renowned African American dancer and choreographer who visited West Africa, observing, learning and participating in local dances and other cultural traditions. It is available through the Alexander Street database. For those interested in further reading about West African dance and percussion, West African Drumming and Dance in North American Universities: An Ethnomusicological Perspective is recommended. 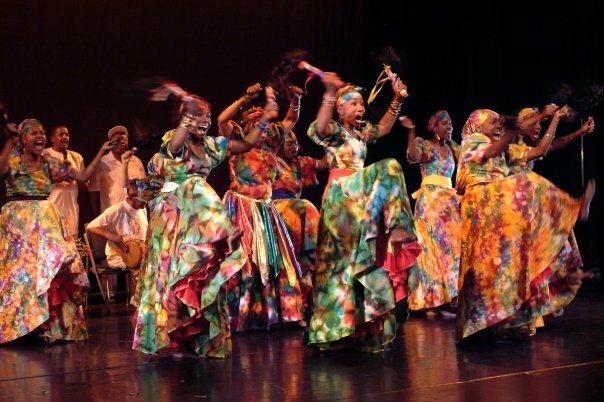 And here is a piece of great news: You can practice West-African dance here at C-U! Mara and other local West African Dance enthusiasts have put together a practice space called the C-U West African Drum and Dance Collective, where Djibril Camara is the local teacher. The group organizes a yearly festival called “The Midwest Mandeng.” Thanks to them, every September master drum and dance instructors from Guinea, Mali, and Senegal come to Urbana-Champaign to teach workshops and give demonstrations. Mark your calendar for next year! As I have mentioned with the other dances above, there is a very interesting evolution of contemporary dance in West Africa that dialogues between traditional dance and international modern styles. 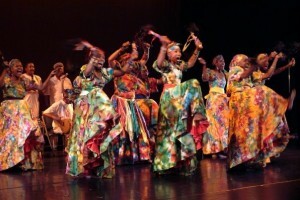 Unlike most contemporary and modern dancers from the U.S. and other western countries, it is common that modern dancers from different African countries are trained first in traditional dance and then they train in other dance forms and techniques. Afrique Danse Contemporaine (Contemporary African Dance) beautifully presents the trajectory of Salia Sanou, renowned dancer and choreographer form Burkina Faso, where he makes a clear statement on the relevance of African voices in the global contemporary dance scene. Here is Poussières de sang, a stunning performance by him in collaboration with Seydou Boro, another choreographer from the same country. All of this is just a little taste of a larger African dance scene. Find more in an engaging documentary called African Dance: Sand, Drum and Shostakovich. We have a vast variety of library resources related to all types of African dance in general and West African dance in particular. Thank you for joining me in the exploration of this art form. If you are as excited about dance as I am and want to keep reading, watching and listening, check out the large amount resources available at different library locations about folk, modern, and classical dance, among others. Especially check out the Music and Performing Arts Library Dance Research Resources. You can also contact our Dance at Illinois department on campus where Faculty have extensive experience about varied international styles, including several professors interested in African influences on contemporary dance. Also, the dance department annually invites guest artists from diverse origins. This year, guest artists bring works influenced by traditions from China, Taiwan, and Israel. You can also follow the schedule of events at the Krannert Center for the Performing Arts which is always showcasing events of interest. You can also ask Mara, our South Asian Studies Librarian about Indian dance! She has a lot to share. 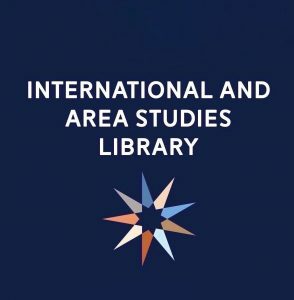 For more information and posts like these, follow the International and Area Studies Facebook page.